Simple patterned papers are great for adding colour to your layouts without making them too busy and cluttered. Plaids and basic textures can be used to enhance your photos, as shown in the layout below. 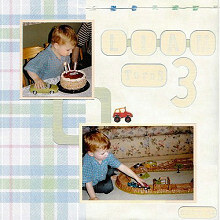 This layout was created using K&Company Blue Roses Blue Plaid paper, two sheets of Creative Imaginations Celery Linen paper, Bazzil cardstock (light green, orange and yellow), white cardstock, blue ink, fibre, ribbon, alphabet stamps, Suzy's Zoo Ollie's Birthday stickers and Persnippity Cars & Trucks stickers. Use the two sheets of Creative Imaginations Celery Linen paper as your background. Cut your K&Company Blue Roses Blue Plaid paper into two pieces - one measuring 5x12 inches and the other 7x12 inches. Adhere the smaller piece down the left side of the left-hand page and the larger piece down the right side of your right-hand page. Select your two photos for the left-hand page. Mat the small one with orange Bazzil cardstock. Mat the large one with yellow Bazzil cardstock. If you wish, you can add a strip of orange Bazzil cardstock to your photo mat, as shown in the layout above. Cut a square measuring approximately 8cm by 8cm and round the corners. Hollow out the square so that the outline is approximately 1.3cm thick. Lightly ink with blue ink and adhere as shown in the layout above. Position your photos on top, as shown above, and adhere. To create the first word of your title (Liam), cut four squares measuring approximately 3.5cm by 3.5cm from yellow Bazzil cardstock. Round the corners and ink the edges with blue ink. Stamp one letter in each square. Cut a strip of green Bazzil cardstock measuring approximately 1cm by 13cm. Adhere to your page approximately 5.5cm from the top and position your letters on top. Stamp your second word (turns) on a strip of yellow Bazzil cardstock. Round the corners and ink the edges with blue ink. Position below the first word of your title. To finish of your title, cut a large number (3) from yellow Bazzil cardstock and ink the edges with blue ink. Adhere to your page. You may also like to add an extra box with the date to the bottom right corner of your page. Finish off the left page by adhering a piece of fibre across the top right of your page and placing a red car sticker from the Persnippity Cars & Trucks stickers above your large photo. Now it's time to move onto the right page. Cut a rectangle of green Bazzil cardstock measuring approximately 18cm by 20cm and round the corners. Hollow out the middle so that the outline is approximately 1.3cm thick. Lightly ink with blue ink and adhere to the middle of your page. Mat your main photo with white cardstock. Mat again with yellow Bazzil cardstock, leaving a gap at the bottom of the mat. Adhere a ribbon in this gap. Position your photo in the top right corner of your page and adhere. Position your other two photos in the bottom left corner of your page, layering one on top of the other as shown in the layout above. Cut a rectangle of orange Bazzil cardstock measuring approximately 5cm by 7cm and round the corners. Adhere your Suzy's Zoo Ollie's Birthday sticker to this rectangle and adhere in the top right corner of your page. Cut four different sized squares from Bazzil cardstock (two yellow and two orange). Round all the corners. Ink the edges of the yellow square and stamp a number in the centre. 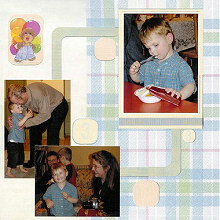 Adhere to your page as shown above to finish off your double-paged layout.